What do you think it takes to organise a stress free, seamless kitchen renovation? The process is design, manufacture and install. We also know it takes attention to detail, meticulous planning and active communication. Exclusiv Kitchens believes our 9 step kitchen design process is the key to organising a stress free kitchen with no surprises and excellent customer service. The first step of any kitchen process is to accurately measure your kitchen space. Inaccurate measurements will lead to false expectations. Call us today on 07-3823-3903 to book an appointment with one of our friendly kitchen designers. We’re meticulous about accurately measuring your kitchen space. 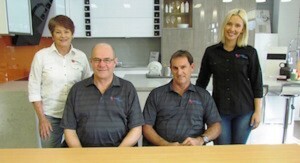 Our experienced kitchen consultants listen to your needs and know what questions to ask. We don’t enforce our ideas onto you, rather offer you our ideas when asked. We have the very best 3D software program that will assist you in visualising your kitchen and bring your kitchen to life. Once we’ve finished designing the first draft of your kitchen we’ll call you and organise another appointment. Most folks are uncomfortable buying something they haven’t seen. 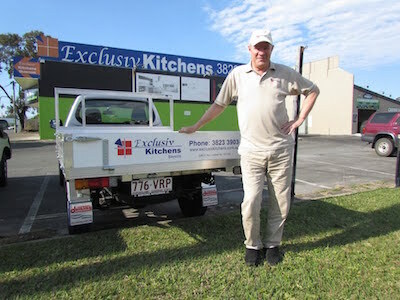 That’s why we encourage our clients to visit the Exclusiv Kitchens showroom in Brisbane. This is where you can see your new kitchen on the big screen and easily relate that design to examples we have in the large showroom. We have a number of kitchens and cabinets on display. You can see and feel the “soft-close” cabinet hardware, numerous handles and the quality and range of materials and products. We have two kitchen showrooms, one in Capalaba and the other in Gaythorne. Would you bother going through the kitchen process if you were told upfront that there were only a handful of design options? When you sit with one of our consultants and start changing your kitchen there really is an extraordinary range of options. There are literally hundreds of colours, cabinets, bench tops and handles to choose from. However we like to take the stress out of this as it can may be overwhelming at times, our in house Interior Designer can assist you with selections and give you up to date style advice. Built the perfect kit chen only to find it’s going to cost double what you want to spend? 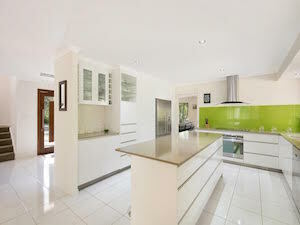 Our kitchen software syncs directly with our kitchen manufacturer and tells us exactly how much your kitchen will cost. We can sit with you and make any changes you like and see how that impacts the cost of your kitchen. At no stage will any pressure be placed on our clients to buy – as this process takes time and we understand this. We pride ourselves on the fact that our manufacturers are local and that we manufacture to the highest international standards. We have 7 years warranty on all of our kitchen cabinets. Your designer kitchen could be just 5 weeks away. Make sure you ask each kitchen company whether they can offer a truly one stop solution? We consider and incorporate any appliances, accessories or building needs that may be required or desired. Whether you are wanting a specific pendant light, stainless steel square edge handles or even a bi-folding window to open up your kitchen, we can help! Using an unqualified installer can ruin your new kitchen. We use competent fully licensed installers making sure you new kitchen is installed perfectly. So that’s our kitchen process, from beginning to end. Take the first step now by calling us on 07-3823-3903 and booking a free in home consultation with one of our friendly kitchen designers. Not sure what you want? Easy… just contact us and we’ll help you!